The Salvator Mundi was thought to be painted by Renaissance master Leonardo da Vinci, but doubts have been cast over the painting's authenticity. The painting, which was unveiled at The National Gallery's 2011 Leonardo exhibition, broke auction records at Christie's in New York, 2017 when it was bought for $450million (£342million). Christie's confirmed the Abu Dhabi Department of Culture and Tourism was 'acquiring' the painting, but its next unveiling, due to take place at the Louvre Abu Dhabi in September, was cancelled with no explanation. 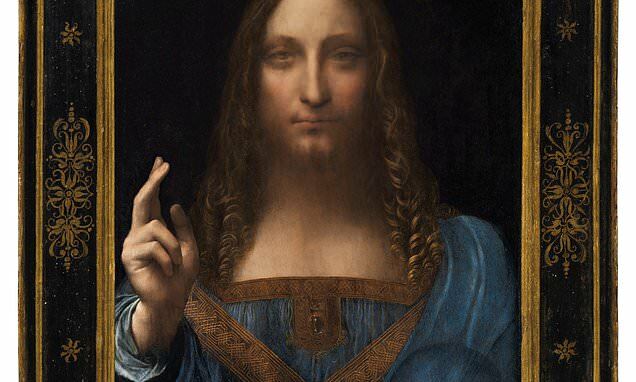 The Salvator Mundi, which depicts Christ as 'Saviour of the World', is now alleged by some to be a 'workshop Leonardo', painted by one of the artist's studio assistants. Art historian Jacques Franck told the Sunday Telegraph that senior politicians and Louvre staff 'know that the Salvator Mundi isn't a Leonardo'. He has reportedly written to French President Emmanuel Macron to warn him against inaugurating the Louvre's Leonardo exhibition this autumn if the allegedly fake painting is included - which would be 'almost scandalous'. The painting was also said to be facing a snub from the Louvre in Paris, who were reported to have scrapped plans to display the work in its Leonardo da Vinci exhibition.